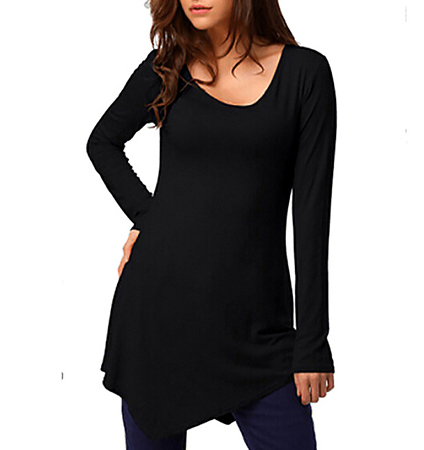 A-line shift style, this shirt offers a scooped neckline with a soft edge and a pointed, asymmetrical hemline which creates great visual interest, offsetting the curves. Tapered trim at the waist, this fine shirt pulls your figure close and hugs your natural curves. A loose fit slips easily over your head and can be worn all day because it is made with style and comfort in mind. Carefully sewn with excellent craftsmanship and layout, this shirt is one you will want to experiment with and wear with plenty of slacks or skirts, boots and high heels. Small size; shoulder 35 cm, bust 84 cm, sleeve length 61 cm, hem width 120 cm, length 83 cm.